The Pultec EQP-1A: originally priced at $475, a new one will now set you back almost four grand. These days, it often seems as if the only qualification required to earn a given piece of recording gear 'legendary' status is for that said piece of gear be old. However, there are a select few studio devices that have truly earned their venerated status - Pulse Techniques' Pultec EQP-1A is undoubtedly one of them. Pulse Techniques - or Pultec - was a two-man company formed by Eugene Shenk and Ollie Summerland. They designed products, handled sales and marketing, and built their legendary processors by hand in New Jersey, USA. Before Pultec, equalisers had a serious drawback in that signals passing through them suffered from a drop in volume ('insertion loss'). Shenk and Summerland had the idea of adding a tube-based makeup gain circuit, thereby ensuring unity gain throughout. Clair Krepps of MGM was the first recipient of the new EQP-1 and confirmed that the pair were indeed onto something, after which the unit was added to Pultec's 1956 catalogue. By 1960, the intrepid engineers had updated the design, adding more frequency selections and rechristening the box as the EQP-1A. This time, they had a bona fide classic on their hands, a status bequeathed entirely on the basis of its outstanding sound. 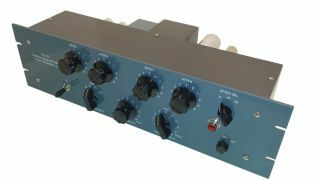 Though its layout and nomenclature can confuse newcomers familiar with modern EQs, the EQP-1A offers fairly standard controls. The low shelving circuit offers selections of 20, 30, 60, and 100Hz and a whopping 13.5dB of boost and 17.5dB of attenuation may be applied. The high frequency circuit offers a peak boost of up to 18dB with bandwidth control. You can boost 3, 4, 5, 8, 10, 12, or 16kHz. 16dB of high shelving attenuation can be applied to 5, 10, or 20kHz. Not that you actually need to boost or cut; simply running tracks through a Pultec makes them sound better. A dedicated midrange unit called the MEQ-5 was also sold, as was an eventual solid-state version of the EQP-1A when such technology became available. Pulse Techniques referred to the EQP-1A as a "program equalizer", so you'd expect it to sound good on full mixes. In fact, it sounds great, with a gorgeous low end and subtly saturated highs. It's also fantastic on individual instruments and is especially loved for its ability to bring focus to kick drums and bass guitars, due to an unusual trick of both boosting and cutting the same frequency with the low shelves. Though that may sound counter-intuitive, the differences between the boost and attenuation curves make this not only possible but highly effective. Another in a series of older UAD plugins that have been reworked and rejigged with better sonics and more options, the Pultec Passive Collection includes a virtual EQP-1A, MEQ-5 and HLF-3C low- and high-cut filters. It's from Universal Audio, so we needn't tell you that the sound is exemplary, and you can have it for 5% the cost of a second-hand original. Acustica Audio are masters of effects sampling, using their VVKT technology, and Nebula is much loved by analogue outboard aficionados. Pultecs are an obvious candidate for the Nebula treatment, and so we have the Cooltec EQP-1 (PC/Mac VST) suite of seven plugins. Each band and function is presented as its own plugin, as is the raw amp stage. This impressive free VST/AU plugin piles not one but three Pultec clones into a tone-shaping tower of power. It's one of the finest software emulations available, and you absolutely need it in your plugins folder.